You tend to be the master weaver of fate - both for yourself and those you know. A creative force, you tend to work from divine inspiration. I've decided to contribute to a feature at the site Cool and Collected called The League of Extraordinary Bloggers. If you are interested, see the link for information on how to join, as you may do so at any time. I saw this back on February and read a few of the initial offerings in the weeks that followed and, until this week, had forgotten about the whole thing for a while. Then I saw this week's topic and read some of the other participants' entries (links to some of those entries will be at the end of my post). Well, I can say there are few shows on TV I have never seen and am debating if I should ever try to watch them and just how. I sadly don't have and can't afford cable (long story). 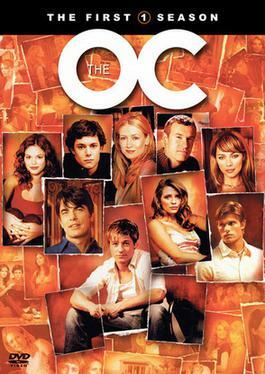 I found the first season of The O.C. at my public library and picked it up. I had to rush to watch all seven discs in a week (DVDs are only allowed out for one week). One of the reasons I hate the idea of renting series discs from Netflix since I only get one DVD at a time and I have a pre-Intel-based Mac so watching instantly on Netflix is out. A complete series is between three and seven discs. I also happened to see two of the seasons of "The Sopranos" at the library (I forget which seasons) and am debating on whether to borrow these. I'm afraid of getting into a show and wanting to see the rest, and don't know how to do so without jamming up my Netflix queue with three- to seven-discs series. I'm sure to get tired after a while, even if I wanted to see the whole series. I've only made a small number of attempts to rent series discs from Netflix. Some other series I've been curious about include "Laguna Beach" and "The Hills." I recently read the "L.A. Candy" book series by Lauren Conrad, who stared on the two shows, and now want to see these shows. I also plan on reading Conrad's spinoff book series "The Fame Game, " but more on that later. And just a while ago at the library I found Season one of the soap-opera parody series "Soap," which I had seen, albeit as reruns in the early 1980s. After borrowing Season One, I saw that Seasons Two and Four were also available, but no Season Three. So I added to that season my queue, pushing back a bunch of DVDs I've had queued for over a year now, by three spaces each. Luckily, it's only three discs, so it won't take too long, and the first disc arrived yesterday and is on its way back as of this afternoon. After the last disc arrives and I finish watching it, I will get Season Four from the library. I had a flashback to watching reruns of "Soap" in 1983 when I was in sixth grade. My local NBC station carried repeats of the show beginning that year in January, at 7:30PM right after "Entertainment Tonight." I only vaguely remembered the show when it first aired as it aired from 1977 to 1981, when I was between the ages of six and 10. The station carried the repeats until the summer of 1983, then brought them back in September, and I could not wait to see them again. All was well until January 1984 when the station pushed "Soap" to 3PM in the afternoon to make room for the just-premiered syndicated version of "Wheel of Fortune" (which they still air today). I did not get out of school until 3:10 so I would not be able to watch the show anymore unless I was home sick. Not sure how many times that happened, but I was eager for spring break to come around so I could watch the show then, since I would be home all week. No such luck. By then, the show had gotten moved again, the wee hours of the morning. I mean, this was 1984, who was watching TV at 3AM then? I mentioned this to family friend in an email I wrote circa 1998, and he too remembered the show being moved to the afternoon, and how he was unable to watch it because he was at work then. Glad I'm not the only one who remembered all that. I also caught reruns of "Soap" on Comedy Central while I was in college in 1997. There are probably plenty of other series I have never seen and now want to see, but far too many to mention. If I had an iPhone or an Intel-based Mac, I'd certainly be watching them instantly on Netflix to save my DVD queue from being jammed with multi-disc series. Well, I may not want to really say I love this, but have been into reading teen and young adult book series, but then I've seen lots of other grownups dong the same, starting with several of my family members reading the "Twilight" series. I then read it and watched the films. I've since gotten into other series including the "Hunger Games,""The Vampire Diaries," the "Night World" series and "The Forbidden Game." I've also started other series including the vampire series "House of Night" (I am waiting to get the third book from my library) and the trilogy "Matched" (going to look for the next book "Crossed" soon). I just now started another series "The Mortal Instruments." I just finished reading the first book and picked up the second one from the library today (I'd put it on hold) and the third one as well since it was in stock. I'm looking for other series similar to any of these, anyone have any ideas? And as I said earlier, I read Lauren Conrad's "L.A. Candy" books and am looking to read her next series, the spinoff "The Fame Game." What other books does any recommend for those who liked these books? It seems there are so many book series now. It gets hard to keep up sometimes. But I try. One I've been curious about is the alphabet murder mysteries by Sue Grafton. Not to sure about starting this one, since it would be 22 weeks of reading, with four more weeks to be determined later (the last four letters of the alphabet, W thru Z, have yet to be covered). Then again, I made it through all 22 of the Stephanie Plum books this year. I can read fast, depending on how much time I have. I've also been interested in the food-themed mystery series by Diane Mott Davidson, the "Donut Shop Mysteries" by Jessica Beck and the "Hannah Swensen Mysteries" by Joanne Fluke, yet another food-themed mystery series. This is something I could go on about. I guess book series sell well and readers are curious to hear more about the character. But enough about this for this blog post. Perhaps I can talk about this more in a separate blog post.